Our school year is almost over! I am so thankful! I’m ready for summer and for a change and for a new routine and for a break and for something different. I just want to feel like we’ve made progress and I want to plan for a new year. In January I’m ready for school to begin again. In February I’m burnt out and ready to quit. In March I get my second wind and we push forward. In April the end is in sight and I just want it to be OVER! In May I can’t finish fast enough and I just feel so very done! So, I had a surrender moment the other week. I just could. not. school. anyone for one. second. longer! And if I was being completely honest, I didn’t want to parent for one more minute. I didn’t want to clean the house ever, ever again. I didn’t want to do one single thing! Give me a book and a bubble bath – on an island far, far away – and I’ll feel a little better. Yes, I just gave up! I was waving my white flag of surrender. I’m done! 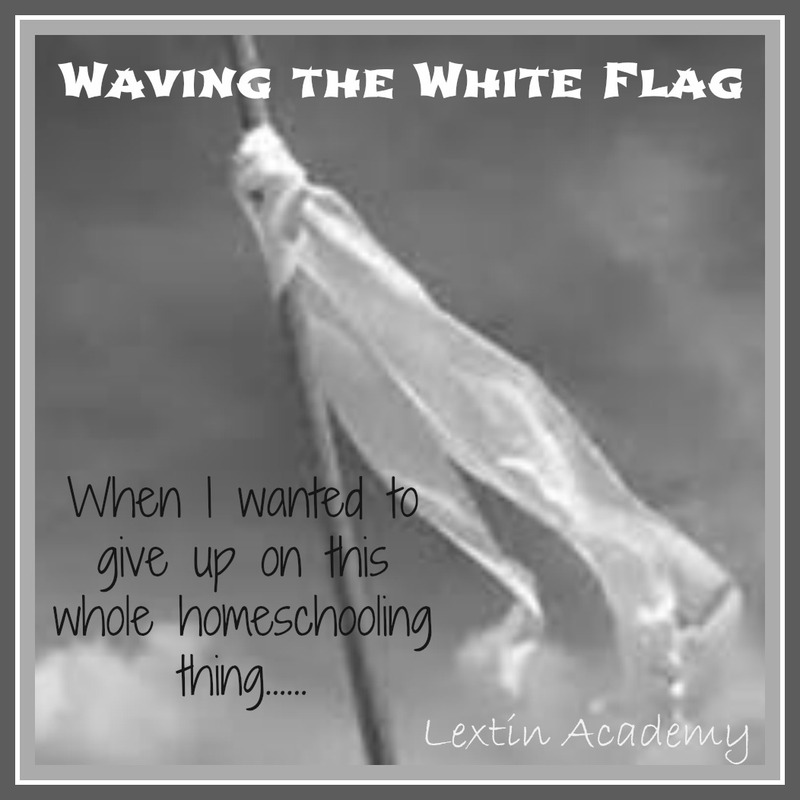 No more mom, teacher, cook, janitor, wife, housekeeper, organizer, schedule follower. Nothing! Thankfully I have wonderful backup – I called in the reinforcements in the form of my hubby. He came to my rescue and saved the day. We looked over my schedule together and made some changes. He took over reading with Tiger for a week and he also did math and spelling with Curly. For one week, I unloaded my most stressful subjects on him. He also did more of the cooking and helped even more with the cleaning. And somewhere in there he bought me a new book. One week was all it took. By the following week, I was slowly coming out of my pity party and I was ready to dive back in. I was ready for spelling, family game nights, new experiments in the kitchen, bike rides, park days, math lessons, and messy art. Yes, we take weeks off when we need it. Yes, we take breaks from our schedule. Yes, we try new things. But somehow none of this had been enough. I was just so very over everything, yet I wanted things to still get done. I just didn’t want to be the one doing any of it! It’s that time of year. I can see the end but the struggle to the finish line is not pretty sometimes. We will finish. I will stay sane. The kids will not kill me (or each other). We have some kind of strange spring fever at our house. We will push through! However, I may need to call in the reinforcements again in a few weeks. No one ever said this was easy! You are preaching to the choir, sister! LOL Wow, feeling the same way. Sometimes I just feel like I can't continue, but then hubby surprises me. I ended up staying home from church Sunday morning for alone time. He packed the kids up in the car. It was 4 glorious hours to myself. LOL We are almost done, we will make it to the finish line, WHOOT! That's great! I get some time tomorrow evening by myself! I'm feeling very "done" but we've almost made it!!! I keep telling myself that I'm almost there!